CEO Tamer Mohamed attended and presented at the 2018 International Conference on Biofabrication in Würzburg, Germany, along with two of our Managers of Academic Alliances. We brought our RX1 Bioprinter with us and gave live printing demonstrations at our booth. This was the first time that we demonstrated our technology in Europe. CSO Sam Wadsworth & CEO Tamer Mohamed attended and presented at the 2018 joint event for BioJapan and Regenerative Medicine Japan. This is Asia's premier partnering event for the global biotechnology industry. Tamer was also a speaker for two session of the Canada Life Sciences Seminar at BioJapan, organized by the Embassy of Canada to Japan. This included a talk on "Enabling the creation of human tissues on demand through strategic partner engagement and ecosystem development" during the a special session on Investment and Business Opportunities in Regenerative Medicine - Canadian Landscape and Success Stories. The International Society for Stem Cell Research hosted their 2018 conference in Melbourne, Australia. This was our first visit to Australia and in addition to exhibiting our RX1 Bioprinter at ISSCR, we also held seminars at Monash University and the University of Wollongong on "3D Bioprinting - The Next Frontier in Medicine." We attended the 2018 BIO International Convention in Boston, MA (Jun 4-7, 2018). Our CEO, Tamer Mohamed participated in the one-on-one partnering and enjoyed meeting with a variety of representatives from academia, industry, and government. 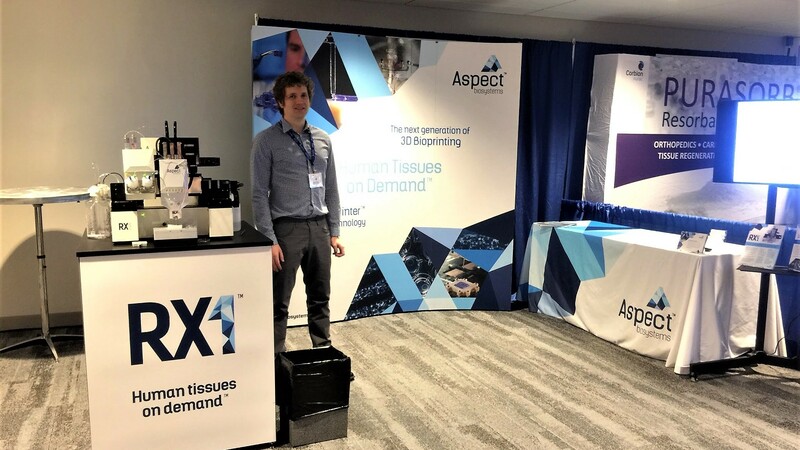 We sponsored, attended and exhibited at the 34th Annual Meeting of the Canadian Biomaterials Society in Victoria, BC (May 16-19, 2018). The Canadian Biomaterials Society is a not-for-profit organization dedicated to the development of biomaterials science, technology, and education in Canadian universities, industry, and government. We were proud to be the Gold Sponsor for this event, and supporting the biomaterials community in Canada. Aspect is also hosted a workshop on 3D bioprinting. Aspect Biosystems' unique Lab-on-a-Printer™ technology merges cutting-edge advancements in 3D printing, microfluidics and biomaterials to faithfully recreate the structure and complexity necessary to build functional human tissues. Using the Lab-on-a-Printer™ technology, our interdisciplinary team of engineers, cell biologists, and tissue engineers are driving the development of physiologically relevant bioprinted tissues for clinical and industry-relevant applications. In this workshop, you will get an introduction to the RX1 Bioprinting platform and explore the considerations for designing and printing functional 3D tissues. We will also be bioprinting relevant tissue structures that can be broadly applied to various tissue engineering applications. See the full schedule of CBS 2018 here. 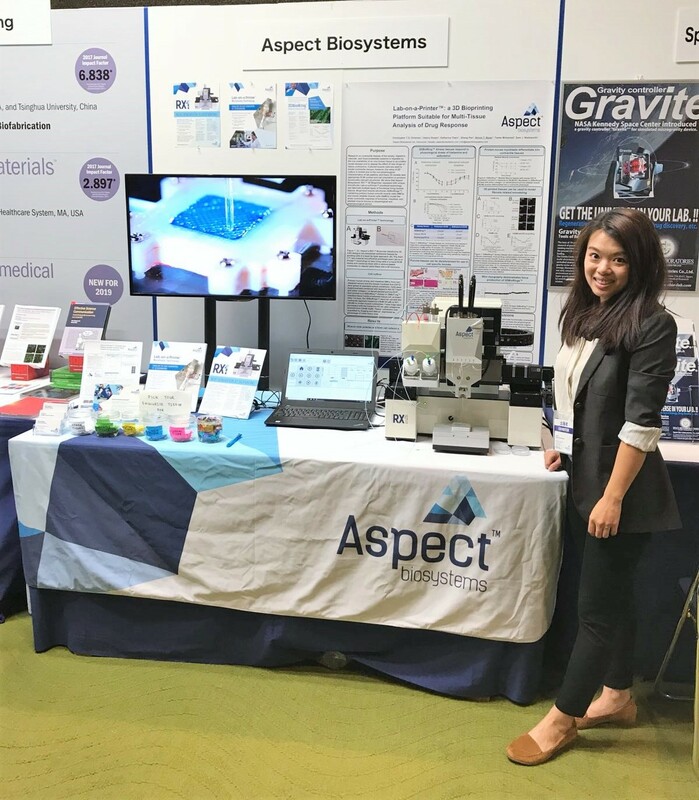 Aspect hosted a workshop at McGill's Hands-On Workshop in 3D-Printing & Microfluidics for Bioengineering in Montreal, QC (May 9-11, 2018). This event focused on the foundations of micro and nano biotechnologies as well as Computer Aided Design (CAD), 3D printing, soft lithography, microfluidics, immunoassays and more. There was an increased focus on 3D bioprinting and tissue engineering this year, which is where Aspect comes in. 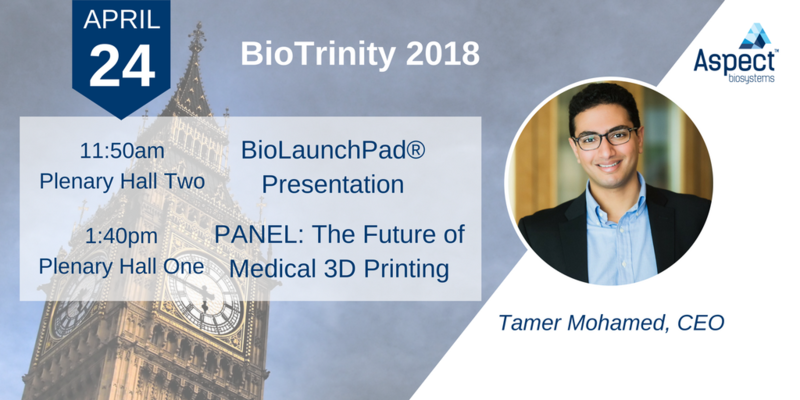 CEO of Aspect Biosystems, Tamer Mohamed, will provide an overview of the current technology landscape and various approaches to bioprinting, as well as the potential applications in life science research and therapeutic development. He will also highlight Aspect's RX1 Bioprinting platform and explore the considerations for designing and printing functional 3D tissues. See the full details and schedule for this workshop here. Our CEO, Tamer Mohamed participated in the one-on-one partnering and is presented TWICE on Tuesday April 24. 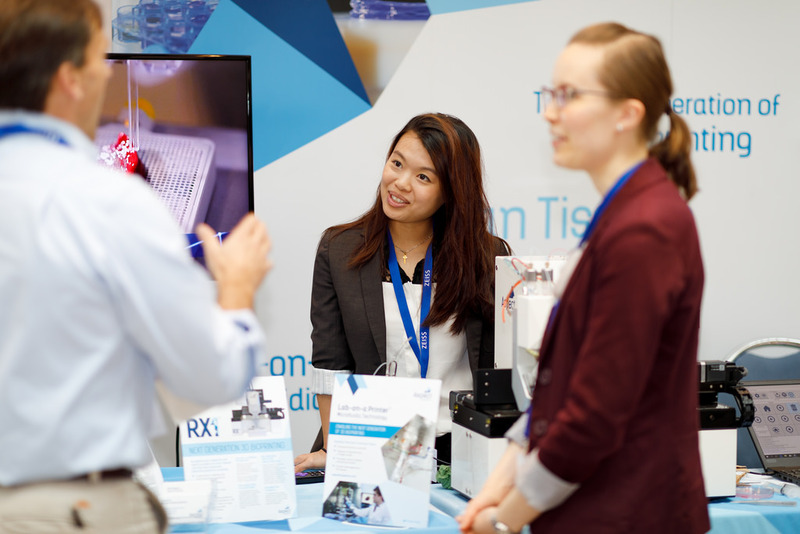 We exhibited at the Society for Biomaterials (SFB) Annual Meeting in Atlanta, GA (April 11-14, 2018) to demonstrate our RX1 bioprinting platform and discuss collaboration on tissue engineering projects. 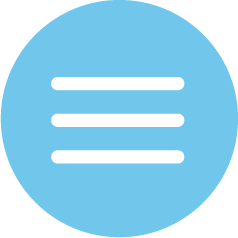 "The Society For Biomaterials is a multidisciplinary society of academic, healthcare, governmental and business professionals dedicated to promoting advances in all aspects of biomaterial science." Dr. Sam Wadsworth’s (our CSO) also spoke on 3D bioprinting personalized neural tissues for drug screening applications, research that is being done in partnership with Dr. Stephanie Willerth from the University of Victoria. Tamer Mohamed, CEO, attended the 3D Medical Expo to speak on "Human Tissues on Demand with Next Generation 3D Bioprinting." 'Bioprinting holds the potential to enable the biofabrication of personalized organs, thus addressing the massive problem of organ waitlists and rejection. By initially focusing on “low-hanging fruit” applications of bioprinting, building off of “early-wins,” and collaborating with researchers and industry, we can make a realistic impact today and propel the ecosystem into the future." The 3D Medical Expo is an annual event that gathers a mix of academics, medical and business professionals to discuss developments in medical technology.